It is probably due to the fact that we have had a run of cold snowy winters. Over the past three or four years and the need for winter tyres are slowly sinking in. We also have a large Polish community in the Halifax area. Of course this is where where my tyre-centre is situated.Polish people are familiar with the need for winter tyres. In fact I think it may now be compulsory in Poland to fit winter tyres from November to march. Hence, the same as some other European countries. We have found over the years that as an independent tyre retailer, most customers think in two ways. Either they know exactly what they want, or they will take our recommendations. Of course, as to which brand and at what price to pay for their tyres. The majority of our customers come to us on word of mouth recommendations. Because they have received good advice and service in the past. Subsequently, we know this because we do not advertise as such. Perhaps, only through social media sites and internet directories. In the past when our profit margins were higher we would regularly take out full page ads in the local papers, costing us an arm and a leg, we never really knew if the ads paid off or not. 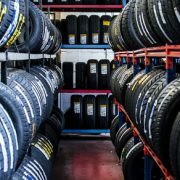 We have and still do sell many different brands of tyres including winter tyres. In the past two years we have been able to buy our tyres from the major tyre companies because we are a member of a buying group known as Point-S tyres. We were very happy to open an account with Nokian Winter Tyres . Because we knew from experience that this company made excellent tyres, including winter tyres. This will be our third year selling Nokian Winter Tyres Winners and we are pleased with the very good response we had from the drivers who have experienced these tyres in winter conditions. The Halifax area is very hilly, we are in the foothills of the Pennine mountain range and therefore we have very tricky roads. Especially in winter snowy conditions. The latest car to arrive for a set of four Nokian Winter Tyres was a Land Rover-Freelander 2-GS-TD4. This nice looking car had a set of four 235/65R17 108H Winter tyres. It’s great when you love the job that you are doing and can write about it in our company blog. Nice Triumph Spitfire-calls into Pellon Tyres for a “Wheel Alignment” Takes Me Back!